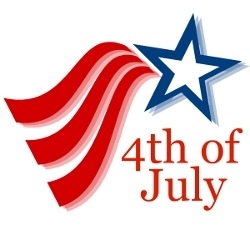 Happy 4th of July to you! Yes, I mean you. Independence day in the US of A brings many families and friends together. The weather is warm, the sun is bright, and most of all you get a free day! No work. Just fun. (Well most of the time). If you do have a free day, you can spend it doing whatever you like, whether it's lounging on the patio for breakfast or sleeping late. Somewhere in the middle of the day there's a picnic, complete with barbecue. And it all ends with a bang, literally, with a spectacular showing of fireworks. MS may or may not put an end to most of the days usual events. At least the way you've always done it in the past. You may need to just rethink the way you do things this year and in the years to come. Instead of being the one who does all the preparations, you may need to learn to delegate. Of course you can help with the planning stage. Especially when you want things done a certain way. The only thing about that, is you may need to step back and let others do things their way – as long as it gets done. Let everyone know what needs doing, then sit back and supervise. It's okay if Jamie gets all blue plates and red napkins instead of the ones with stars and stripes. Or if the potatoe salad doesn't have enough pickle relish. It still tastes great even if it isn't your recipe. The point is, you will all have fun. Everyone will be fed and happy. You won't be stressed – I know you won't – because you'll only do what you can handle. And when you need to rest, you'll sit in a lounge chair and relax. Cir has long since realized his limitations and rarely pushes himself to the point of exhaustion. He takes it easy and knows when to say no. If push comes to shove, there's always another day. There's no law that says you have to celebrate on a particular day. Can I get a raincheck please? If you need to postpone an outing, do it. It's just as fun – maybe even more-so - to have a picnic in the middle of the week. So chill out, (I mean that nicely), and have fun! And again Happy 4th of July!! Go to the Life in Spite of MS Blog.